So, when my friend Dana and her boyfriend had a party last weekend, they asked if I'd be in charge of the martini making. They provided an array of the aforementioned Charbay vodkas, and just let me create. I came up with a few to have as samples, so that guests could try a 'taste' first. Here are the "samples": on the right, the "Tropic-tini", in the middle the very smooth Lemon Drop, and on the left is the Pomegranate Punch. My secret ingredient in the Pomegranate Punch and the Lemondrop was my homemade (or should I say home-stilled?) limoncello. Confession: Are there certain foods that you enjoy eating out, or when someone else prepares them, but intimidate you when it comes to cooking it at home? It may even be something simple, like an artichoke for instance. Friday night came, and after a week of travel for Scott, we both felt like staying in. Since Friday night usually means going out for happy hour, I wanted to keep that theme but do it at home. I also had the urge to challenge myself to try one of those "intimidating" foods. So, while I was "studying" material for a business trip to Dallas next week, I came up with our happy hour appetizer menu. I was going to conquer artichokes, and crab cakes. Two new cooking challenges! With shrimp cocktail and cheese and crackers, we had the perfect "in home happy hour." I prepared the artichoke as I had seen done by a chef teaching a recent knife skills class. After steaming the artichoke, I made a simple sauce that I also learned in the class, which consisted of 1 part stone ground mustard, to 2 parts mayonnaise, a squeeze of lemon juice, salt and pepper. Scott and I started off the happy hour with the artichoke and a glass of pinot grigio while planning the crab cakes. The artichoke was excellent -and I overcame my (minor) intimidation of cooking an artichoke. With my newfound confidence, I decided that the crab cake couldn't be just any ordinary crab cake, but instead I would try to recreate an excellent crab cake we had recently. What makes it different you ask? Imagine a crab cake with huge lump meat crab, very little breading, just a touch of mayo, and a crab-tastic taste. That's what I was aiming for. I used the recipe in Amanda Hesser's Cooking For Mr. Latte as a base, but also incorporated the recipe on the crab meat container. Served a top an apple fennel slaw, which is an idea I stole from the restaurant Skye, on a recent visit. 1 Tbsp each, butter and olive oil for frying. In a large bowl, combine the crab and the rest of the ingredients, except panko and olive oil/butter. Gently mix. Form into thick patties and coat with panko. Heat saute pan over medium high heat and add butter and olive oil. After well heated (butter is slightly browned) add the crab cakes. Cook 8-10 minutes turning once - or until done. Step-by-step photos: first up, the crab cakes prior to cooking. Next, are the crab cakes getting nice and toasty on the stove. Combine ingredients for dressing in a large bowl. Add the vegetables and apple and combine. Below is my plate of the complete happy hour tasting menu. In the last few years I have come to love this time of the year. Not just because the temperatures are finally dipping below the century point (barely) in Phoenix, but because fresh figs are finding their way into the markets. Fig season is fairly short, so when I can get my hands on some, I tend to hoard them. We enjoy them in the raw, just washed; stuffed with a little blue cheese and drizzled with balsamic, in salads, on bruschetta, etc. 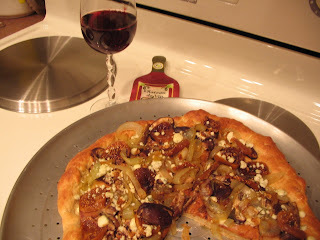 But, I think my favorite thus far, is this pizza recipe we came up with last year during fig season. It really is a conglomeration of ideas I've seen in various cooking magazines. This photos was taken last year, but I made this again last week, and it's just as good. Preheat oven to 400 degrees. Heat saute pan over medium heat. Add butter, and start sauteeing the onions. Once they are soft and nearly translucent, add approx. 1 tsp. sugar, and a little more butter. Cover and let them "carmelize" over low heat for approx. 15 minutes. Add the mushrooms and cook an additional 5 -7 minutes. While onions are cooking, begin the pizza dough. Add the dried rosemary to the dough and knead it to mix the herbs evenly, being careful not to overwork the dough. Roll out pizza dough onto a baking pan or baking stone. Once at the desired thickness, top with mozzarella, figs, and onion-mushroom mixture. Sprinkle with gorgonzola. Bake 10-15 minutes. We had this with a bottle of Hayman & Hill Pinot Noir, which was a gem we originally tasted at a great spot called Elements. The sweetness of the figs, along with the "earthy" mushrooms make pinot noir an excellent pairing. 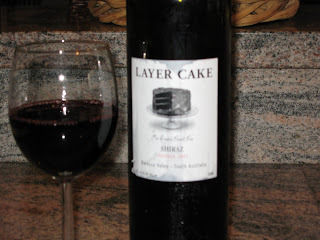 Shown below with a layer cake we enjoyed earlier this week. Paw and Pours Goes to the Great Outdoors! Sunday morning we woke up and decided to do something a little different. It was too hot to take the dog on a walk around here (approaching 100 degrees at 8:15 am!) So, we decided to head to someplace a bit cooler and get a little exercise. After making some homemade blueberry pancakes to fuel us, we loaded the car with the dog and a picnic and headed north. The drive alone was worth it -- as we climbed in altitude the cacti of the Sonoran desert faded away to the Ponderosa pinetrees of the Mogollon Rim. Just over an hour later, we arrived at Christopher Creek, standing among the pinon pinetrees and enjoying the cool mountain air -- and feeling worlds away from the relentless heat of Phoenix. But before we could get to that picnic, we had to do a little "work" first. The Horton Creek Trail was just what we were looking for -- a moderate 7-mile roundtrip hike through the forest. Chase was on full "hunter" mode, leading the way (more like sprinting the way) through the trees, in a frenzied search for the water he could hear cascading down the creek. Chase managed to find the creek just about whenever he could, and led us on the hike the entire time. The trail ended at the head of Horton Springs where it gushes ice cold out of the side of a mountain - pure mountain spring water to refresh all of us!